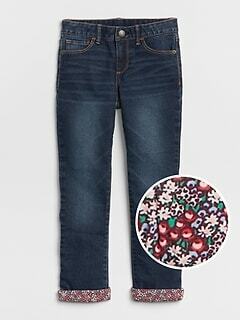 The girls straight leg jeans featured at Gap are more than simple wardrobe staples. They’re comfortable creations that never go out of style and can be worn with anything. This selection of jeans features a range of washes from medium to dark with distress detailing on certain styles. The slight whiskering accent provides a unique fashion touch. Choose from regular, slim, and plus sizes to give her a flattering fit and structure. 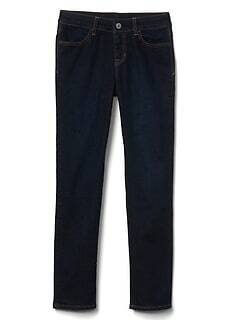 Find the length you need for your tall kid’s leg with the slender jeans options. The premium, super soft denim is designed for comfortable stretch for a fabulous fit. The fading, whiskering, and distressing accents lend a unique look to every pair of jeans. The classic five-pocket styling with button closure and zip fly is timeless. The concealed adjustable waist allows her to have the perfect fit for her changing body. The durable material will last through her wildest adventures and repeated washing. Discover the versatility of jeans with this wonderful collection. The dark wash jeans pair with an embroidered tunic and flats for a dressier option. Replace the tunic with a button-up blouse to upgrade her fashion for fancy events. Kick up her casual look for school or the playground with the light wash jeans and a cute graphic tee. The distressed jeans impart cool, hip style and complement her pullover sweater or hoodie. The neutrality of these jeans serves as the perfect backdrop to tanks, camis and cardigans, t-shirts, and more. Accessorize them with adorable belts for an eye-catching touch. 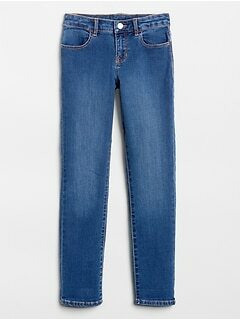 The straight leg jeans for girls available at Gap give her the option to dress up her look for a stylish day or keep it simple for a casual fashion statement.